In 1992, I stood by as my father went to the hospital for his first open-heart surgery. He was 100 pounds overweight and the doctors said that his heart had to work ten times harder than normal to keep him alive. Several operations and many Intensive Care Units later, he died on June 25th, 1995. I too was overweight. I was a quick study though, as I saw how ill my father was. I began studying health and fitness in the winter of 1992. Eight months later I had lost 40 pounds and six inches around my waist. It was then that I knew I could help others avoid the same fate that my father had seen. I went back to school, became a certified personal trainer and now own Fit 'N' Well Personal Training Inc.
Today I dedicate the success of my business to the memory of my father. I take great pride in every training program that I develop. Fit 'N' Well Personal Trainers treat each client with the same amount of detail and attention as they would use to train their own mother, father or close friend. 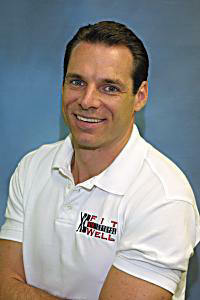 At Fit 'N' Well, we have an unbridled passion for health and the absence of disease. We go to great lengths to do what ever we can to see you reach your goals in a healthy manner. If you are serious about improving your health, give us a call. We look forward to helping you reach your fitness goals. In the meantime keep... fit 'n' well.